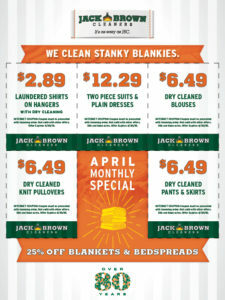 Austin, Texas-based Jack Brown Cleaners is a family-owned and operated dry cleaning company with its roots in the very beginnings of the dry cleaning industry. In 1904, Jack Brown’s grandfather, Z. Taylor Brown, an engineer and attorney, went to the World’s Fair in St. Louis and was so fascinated by the working exhibit of a “steam laundry”, he bought it on the spot and had it shipped back by rail to his home in Midland, Texas. It sat in storage until 1907, when he gave it to his son, Paul, as a wedding present. Paul installed the equipment and began taking in laundry from Midland residents, even delivering it to their homes in his horse and buggy after his laundry closed for the night. Midland flourished with the oil boom, and with it, Paul Brown’s steam laundry business prospered and grew. In the late 20’s, an oil boom hit Eastland County, Texas, and Paul moved the laundry to Eastland and opened another in Cisco, about 20 miles away. When the oil boom ended in the early 30’s, Paul moved the laundry back to Midland and reopened. It stayed there until 1935, when Paul moved the laundry to Austin, and opened his first store at 1600 San Jacinto Street. 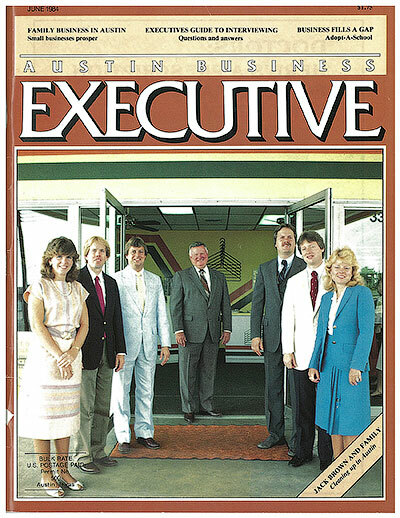 Paul Brown’s San Jacinto Laundry thrived, and in 1939, the building needed to be expanded, and was doubled in size. At this time, a dry cleaning machine was added, to complete the full-service laundry and dry cleaning plant. In 1943, a devastating fire broke out and all of the equipment except a flatwork iron was lost. Through the generosity of the local competitor, Paul was able to use his plant at night and business continued while the San Jacinto Laundry was rebuilt. This was not an easy task, as World War II was in high gear and steel was extremely hard to obtain. It took almost a year to get back in business. As the war ended, men and women went back to college in Austin, and the Brown family was there to serve them with their laundry and dry cleaning needs. The San Jacinto Laundry began to launder wholesale shirts for other cleaning businesses and linens for the University of Texas at Austin’s dorms and neighboring motels. In 1951, Paul’s son, Jack, entered the business and took over the production chores. 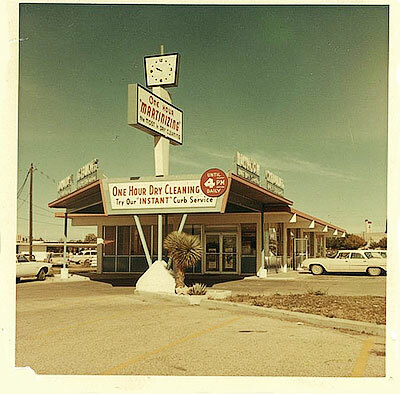 Under Jack’s direction, the business continued to grow and in 1961, he purchased a One-Hour Martinizing Cleaners on his own and hired a manager to run it, while still doing production at the San Jacinto Laundry. Over the next few years, Jack put in three more One-Hour Martinizing dry cleaning plants, feeding the shirts, pants, and linens to the San Jacinto Laundry. To fill the loss of business during summers, when university students were gone, the laundry sent one to two trucks per day to Kerrville, Texas, to pick up the boys and girls clothes from the summer camps. This is where Jack’s children really came into service. Steve, Gail, Terry, Kevin, Jeff, Mary Lauren and Paul were all pressed into service, picking up, delivering, checking the garments, tumbling, and packaging. This experience prepared them for later service as they finished college and entered the family business.